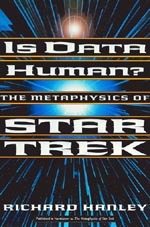 Based on a philosophy course at the University of Maryland, obviously this book is just not more Star Trek "hype". As a metaphor for learning, the philosophic Enterprise has a mission not unlike the starship of the same name. Why explore philosophy using Star Trek? There is a good opportunity to learn something about metaphysics--the nature of existence. Where the starship travels fictional outer space, the philosophic enterprise traverses "logical space" visiting various possible worlds. While visiting don't be afraid to ponder why philosophy faculty need to use the fictionally possible to help their students think about their non-fictional possibilities. Oh well, if it engages your thinking and imaginative faculties, why not!